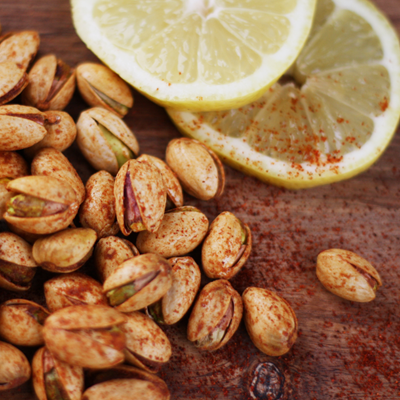 Yurosek Farms Chili Lemon Roasted Pistachios are the finest, bar none! 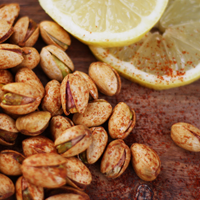 Enjoy the sweet taste of our California-grown pistachios paired with the zesty heat of chili-lemon seasoning. Make sure you take advantage of our "Buy more and Save" on this 14 oz bag of Chili Lemon Pistachios, because one bag won't be enough! Best tasting pistachios I have ever eaten and delivered in one day!! Owner Response:Hi Patrick. Yes that is correct. In the pistachio world the sizing goes as follows.. 18/20 which means 18-20 pistachios per ounce and 21/25 which means 21-25 pistachios per ounce. The flavored pistachios are a 21/25 size and the roasted salted are a 18/20 size. The sizing differs from year to year depending on what size the trees yield. I hope this information helps. Please let us know if you have any further questions. Owner Response:That's great news! 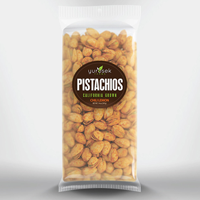 We love to hear our pistachio lovers are satisfied.